ADMIT IT: We can talk all you want about squirt and throw and angles of incidence, but the break is pool's glamour shot. It's our answer to Brad Pitt, while position play more closely resembles Paul Giamatti. The kicker is that it's essential to have a good break. In most games, it determines whether or not you can continue playing. And let's be serious - you want to hit 'em hard, right? So we turned to the pros for their top tips on serving up a molar-rattling, shaft-bending opening salvo. Try 'em all. You'll feel like a star in no time. 3. Sidespin. Avoid left or right hand English. You want to keep the cue ball from scratching, and side English will impel the cue ball to dance around the table until it falls drunkenly into a pocket. Some pros may use a hair of left or right if they're consistently scratching on otherwise solid breaks (for example, a little left if you're always scratching in the right side pocket, says Shawn Putnam), but they're professionals. 4. Stance. Some experts suggest narrowing your stance, and that helps if you plan on propelling your hips and torso forward on the break stroke (see Tip 18). Most pros favor their front foot on the break anyway. And it's a good idea to stand more upright than you would on a regular shot. Your stroke will need some clearance for a big follow-through, and upward motion is just wasted on the shot anyway. But make sure you still keep your legs bent. That will help you generate momentum. Everybody has their own interpretation of these principles, and you can see Thorsten Hohmann's on page 42. 5. Position tricks. Every table breaks differently, but there are a few tricky ways to find the sweet spot in a hurry. First, check the cloth for tell-tale signs of wear. Previous players will have found the best cue-ball position for the break, so you should see marks for that position, and streaks leading to the foot spot. Second, if you know your table ahead of time, check out an earlier match to see where the players are breaking and what speed seems to be working. 6. Where to start - 9-ball. Unless the rules mandate breaking from the box, most pros start breaking from a point a few inches from either the left or right rail. Depending on the result, they could move in a few more inches, which usually will affect the path of the 1 ball as it flirts with the side pocket (and the wing balls to a varying degree). Another option is to switch sides and/or the speed of your stroke. 7. Object ball paths - 9-ball. 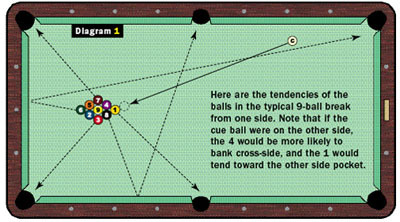 In Diagram 1 below is a map of the tendencies of the object balls on a 9-ball break. Obviously, these are best-case scenarios. The key balls to watch are the head ball (1 in the diagram) and the wing balls (7 and 3), as they are the most reliable. 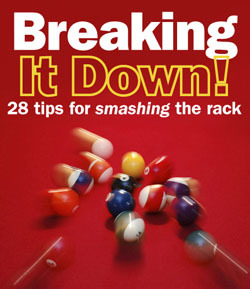 Expert players will adjust the position of their cue ball along the headstring, and/or the speed of their break, until they can reliably sink one or more of these balls.